Katherine, a New York certified music teacher, received a Master of Arts degree in Instrumental Conducting from Mansfield University in 2006 and a Bachelor of Music degree in Music Education from SUNY Fredonia in 2001. A pianist for 29 years, Katherine studied at the Eastman School of Music Community Division with Dr. Gary Fisher and with Julliard graduate and international piano soloist, Robert Jordan. She performs as a church musician and in musical pit orchestras and has accompanied at graduation recitals and solo festivals. 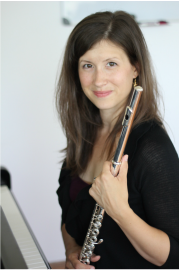 Katherine studied with recording artist and SUNY Fredonia professor of flute, Dr. Susan Royal and with flutist, Dr. Christine Moulton at Mansfield University. Her 26 years of flute experience includes performances in solo recitals, musical pit orchestras, chamber ensembles, orchestras and wind bands. She directed band programs in New York State for over five years where she taught wind and percussion lessons in the fourth through twelfth grades. Katherine taught piano at the Summer Youth Camp of Mansfield University and held positions for two years as a flute instructor at both the Trinity Lutheran School of Wellsboro, Pennsylvania and the Summer Youth Camp of Mansfield University. For the past four years, she has been primarily focused on building a private teaching studio. During that time she has also volunteered as a music teacher to homeschooled families and enjoyed various performing engagements. Katherine is an active member of the National Guild of Piano Teachers. Her students have received high marks at solo festivals and have been accepted into advanced high school music programs and the SUNY Fredonia School of Music.